Enron, the energy firm which went spectacularly bust in December 2001, has seen its iconic headquarters in downtown Houston sold for $55.5m. 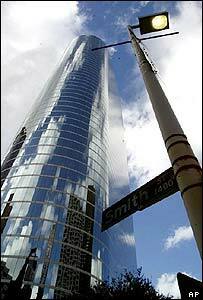 The 50-storey oval glass tower is to go to a private investors' group once a bankruptcy judge approves the sale. The seller is a banking consortium, who bought the tower in the 1990s for $285m and leased it to the energy group. Enron's bankruptcy followed revelations that it had hidden huge debts offshore to inflate its profits by $1.1bn. The price tag is barely above the minimum Enron had expected, and is well below the building's $93m local tax valuation. Enron is still occupying the building, but is set to move out to smaller, cheaper premises early next year. At its peak it had 7,500 people working there, but only 1,200 are left. Most of the others lost their jobs and their share portfolios as the company crashed - a source of some bitterness as top management had been selling up for some time before the collapse. Investigation proceedings are still ongoing against many of Enron's executives, including former chairman and chief executive Kenneth Lay. Other officers are facing criminal charges - not least ex-finance chief Andrew Fastow, who is accused of masterminding the web of complex financial structures that camouflaged the firm's debts. Modern art and photographs from the walls of the Enron offices had earlier been auctioned to help ease the disgraced company's debts.